The tale resumes of the mysterious Agent Graves, who offers ordinary wronged people the opportunity to kill with impunity using 100 bullets that he supplies them with. But even as Agent Graves continues to approach and manipulate his "clients," questions about the ghoulish agent start to arise as people from his past begin to appear, revealing interesting information about their former acquaintance. In the end though, these facts only lead to different questions as the mystery behind Agent Graves' motives deepens. 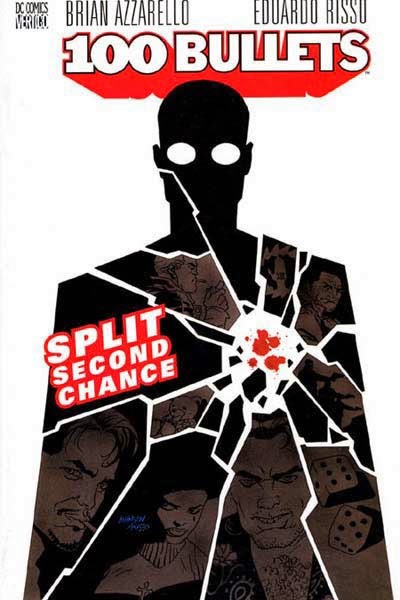 The second volume continues with Graves giving more wronged characters the Faustian choice of a lifetime. The first arc was done really well, with developed backstory, and a vague outcome, which I really liked. Another of the character's stories (Heartbreak Sunnyside Up) was particularly disturbin and raw. Her decision was the quickest and most volatile of all, and raised a good few questions with me. Why believe a stranger? Is revenge so desperately sought by the human mind that we will believe anything just to get to it? This issue was by far the best within this collection. As I'd hoped in my review of volume one, we spend a bit more time here exploring Agent Graves; his past, his colleagues/friends, and mostly his motive. As expected, however, this exploration raises more questions than answers surrounding this impenetrable character. Why does he give people these opportunities? What is the purpose of the secret, above the law, organisation some of the dialogue is alluding to? Dizzy, a character from volume one, appears again in Paris to track down a new character. Her return was a welcome piece of continuity, and it was great to see the Parisian streets and landmarks portrayed in an incredible dark setting by Risso. Things are getting complicated, and even darker than expected. Volume two has definitely piqued my interest in the story even further, so volume three is on its way.